Krill Oil is 100% Pure Cold Pressed Antarctic Krill Oil by Everest Nutrition that contains 300mg Omega-3 & 165mg EPA, 95mg DHA. 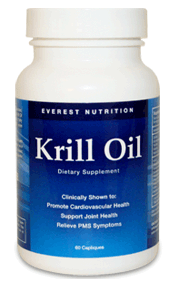 Right now, through the KrillOil.com Holiday Giveaway they are giving away 2,000 FREE 7-day trial bottles of Everest Nutrition Krill Oil through KrillOil.com. Just scroll down to the bottom of their web site and click on the banner ad to get a free sample bottle. One Trial Per Household & While Supplies Last. Once you request it, you'll be sent a confirmation e-mail. You'll have to click the link in that email to complete your request.